In every age and in every culture there have been women who challenged the prevailing gender prescriptions and struck a nerve, resulting in waves of either change or repression. 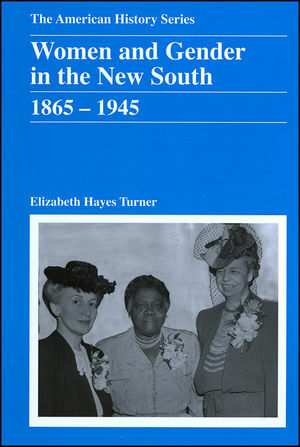 In Women and Gender in the New South, Elizabeth Hayes Turner draws on a multiplicity of sources—part of the great outpouring of works in the field of women’s history that has emerged in the past 40 years—to bring together in one volume the history of conservative, moderate, and even radical women’s groups. The book demonstrates how women and men from different racial and economic backgrounds not only weathered but also shaped the political and cultural landscape of the New South. Employing women's history, gender analysis, and race and class studies, Women and Gender in the New South shapes this accumulated scholarship into an interpretative overlay that takes southern women and men from the ravages of one war to the opportunities of another. Elizabeth Hayes Turner is Associate Professor of History at the University of North Texas. She is the author of Women, Culture, and Community; Religion and Reform in Galveston, 1880-1920 (1997), which won three scholarly awards, and co-author of Galveston and the 1900 Storm: Catastrophe and Catalyst (2000). Professor Turner is the author of several articles and co-editor of Hidden Histories of Women in the New South (1994). Beyond Image and Convention: Explorations in Southern Women’s History (1998); Major Problems in the History of the American South (1999); Clio’s Southern Sisters: Interviews with Leaders of the Southern Association for Women Historians (2004); and Lone Star Pasts: Memory and History in Texas (2007), which won the T. R. Fehrenbach Award in Texas history. In 2003 she was a Fulbright Lecturer to the University of Genoa, Italy. Her teaching specialties are history of the New South, Southern Autobiography, and Women and Gender in the New South.